Corbett Haiti Dot Org � Main/HomePage? We welcome you to Discover and Discuss Haiti. This site and the associated mailing list are open to all who share an interest in Haiti. In 1994, two years before the Internet forever changed our knowledge of the world, Bob Corbett began a Mailing List focusing on all aspects of Haitian life. From the dictatorship of "Baby Doc", the election and overthrow of Aristide, the languishing and tyranny of anarchy that reigned at the turn of the century, the struggle to right itself and regain self governance, the coming of the terrible quake in 2010, and the struggle once again to build itself, members of this list have watched and helped as they could as Haiti sought her way. Archives exist from 1997 to the present. They represent an unprecedented source of material for research. Hundreds of academic papers and commentary by Professor Corbett and others may be found in the Web Archive which is also hosted here. Archives are also maintained here for the Mailing List and the Corbett Web Site on Haiti. The general consensus is that while Haiti no longer has the Duvaliers, Duvalierism dominates Haiti. Elizabeth Abbott's book is an attempt to detail the origins of Duvalierism, and to follow its changes in the various periods of the lives of the two Duvaliers. Finally, she explains how the system works today, and what the political infighting is all about. 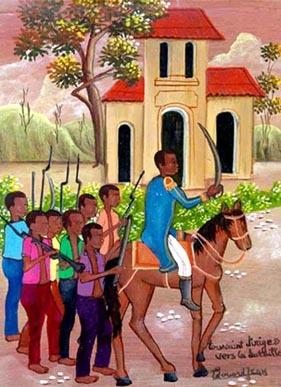 The book clearly illustrates that Aristide has a close identification with the suffering in Haiti; he writes that this "is a story not of one man, but of a people, my people" (1990, p. 16). And he clearly identifies the struggle of the people in Haiti with the struggles of the powerless everywhere, especially in Latin America, writing, for example, "Here in Haiti, we consider every attack against you an attack against us, just as every injury or death that we suffer in our dark corner of the world is a death or injury that you feel, too" (1990, p. 47). The question I am asked most frequently is: WHY IS HAITI SO POOR? This is a difficult thing for people to understand, especially for those of us living in a country as rich as the United States. There are some very obvious conditions to note in Haiti's case: the long history of political oppression, soil erosion, lack of knowledge and literacy, a large populace in a small country. But a question of CAUSES for such poverty is extremely complex. I have tried to respond to the question in a manner that points up this incredible complexity. Nonetheless, to stay in the confines of paper that could be read at one sitting, I have had to highlight, condense and simplify. This issue is a difficult one for you the reader. I urge you to stick with it, to wade through. Haiti is the poorest country in the Western Hemisphere. The Haitian masses suffer some of the most debilitating and depressing misery of any people in the world. Yet, virtually all that misery is human caused, in most cases, by a tiny minority inside and outside Haiti who have the wealth and power to control. There is no cost to either join the list or contribute to this site. All information on this site is released under a GPL Share Alike with Attribution License unless specifically identified otherwise by the contributor. Retrieved from www.corbetthaiti.org on (DATE). Copyrights remain the property of the original contributor. Used by permission. Last modified on June 16, 2014, at 03:38 PM - Site Design by Doctor IT. - Copyright by their respective owners. - Powered by PmWiki.